3D high-elastic & shock-proof silicone cushion for reduced friction, designed with multiple air holes for enhanced permeability. Hem designed with silicone antislip strip for well placement. Back pocket and leg opening with highlight reflective strips to ensure safe night cycling. Three seperated pockets on the back side for small items. Moisture absorption and sweat releasing mesh fabric adopted to keep it in shape, breathable and quick-drying. Material: Jacket: 100% polyester (sports mesh fabric), pants: 80% polyester + 20% elastic lycra fabric (80% dacron + 20% lycra). 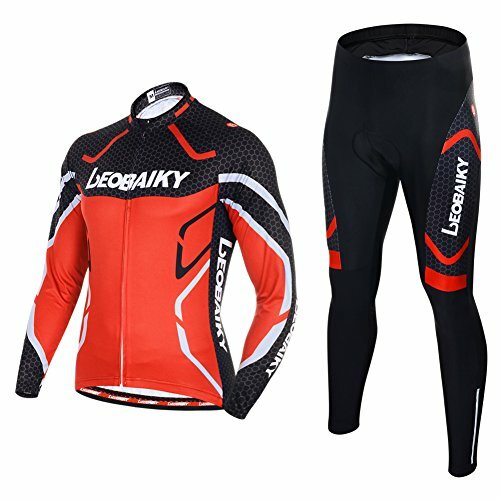 Package includes: 1 x Long Sleeve Cycling Jersey Suit.